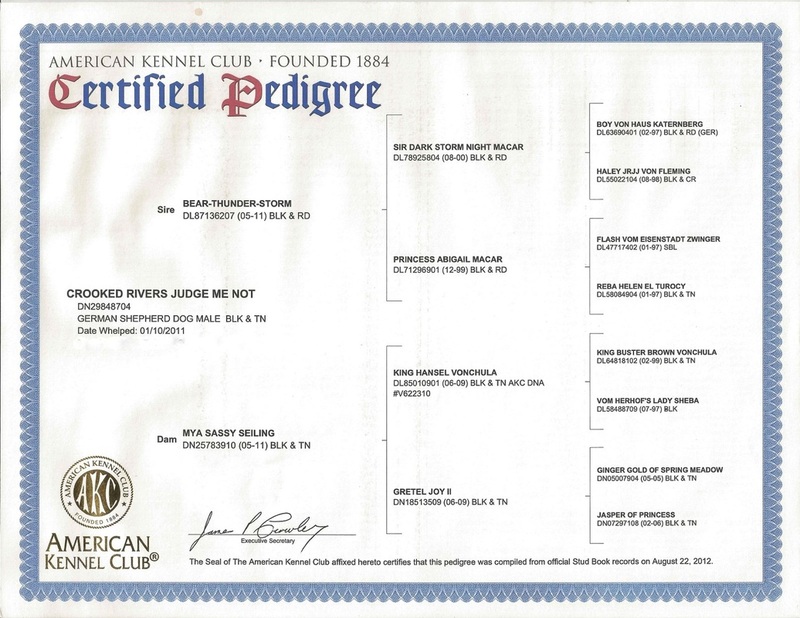 "My puppies come with AKC (American Kennel Club) papers and a pedigree." They expect you to respond with an awed whistle. Here's a better response: O yay. meant good quality. That's what the CKC and AKC would like you to believe. But it's not true. The CKC or AKC will register any puppy whose parents are registered. The CKC or AKC registered those parents because their parents were registered. And so on. CKC or AKC registration is a mechanical process, a chain of numbers. puppy to the chain, sending you a piece of paper with a number on it. Voila . . . your puppy is registered. you're willing to pay for. Voila . . . your puppy's pedigree. A pedigree is just a list of doggy names. same kind of registration number they give to the Best of Breed winner at the Westminster Kennel Club show. "Good grief! And here I thought CKC and AKC registered meant good quality!" check and often a mechanical safety check. The CKC and AKC registers dogs with no health or safety checks at all. pedigrees is just not a big selling point, no matter how loudly a breeder trumpets it in his classified ad. genes are the only genes his parents have to give, they're the only genes the puppy can inherit. coat that sheds, etc. Those genes are fixed in the breed's gene pool – there are no other choices. presence or absence of registration papers has no effect on those genes. ﻿That's what makes a dog purebred – inheriting genes from the fixed gene pool of his breed. In fact, a dog can have registration papers, yet still not be purebred. can be falsified. 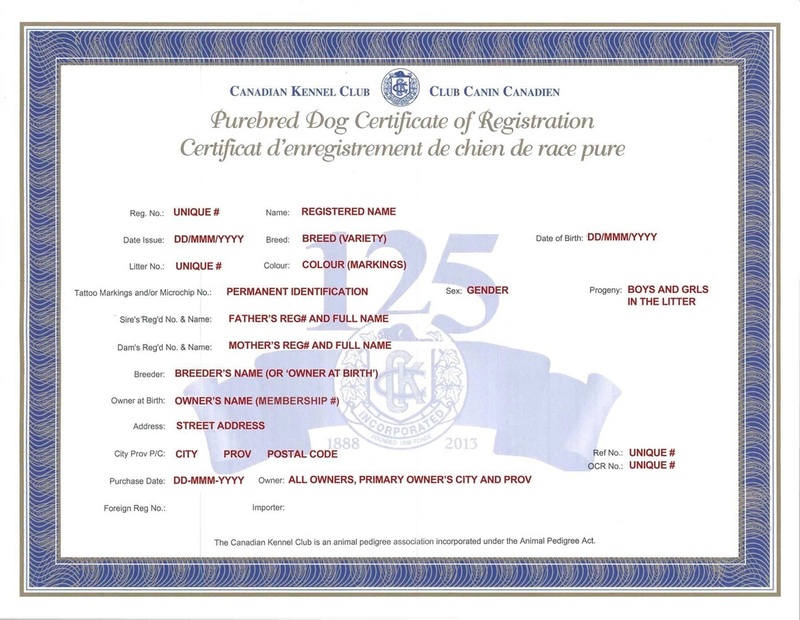 Most registries, such as the CKC and AKC, operate primarily on the honor system. They simply take the breeder's word for it that "King" and "Queen" were really the parents of Solomon. But scams happen all the time. Let's say Dishonest Dave has two purebred Boxers with registration papers. Dishonest Dave is unwilling to give up the $600 he could get for "AKC registered Boxer puppies" so when the litter arrives, he simply fills out the litter registration paperwork – claiming that his BOXER was actually the father. The CKC and AKC will dutifully mail him a packet of Boxer registration papers for each puppy, which he will happily pass along to the buyer of each puppy....collecting his $600 as he does so. And no one will be the wiser until the puppies grow up and start to look suspiciously non-Boxerish. puppy's parents really are, look for breeders who participate in this program. without having papers – and sadly, he can have papers without really being purebred.